Introducing the MCP355 pump: despite a remarkably small footprint of 2.4" square, the MCP355 features an astounding 20ft of head to provide superior flow rates in today's most complex liquid cooled systems. The MCP355 is also a high reliability, high pressure industrial pump, featuring a 50,000 hour MTBF (5 year lifetime). Such reliability is afforded by the unique design of this pump, which contains only one moving part: the magnetically driven rotor/impeller spins on a single ceramic bearing, thus extending the life of this pump beyond existing standards. 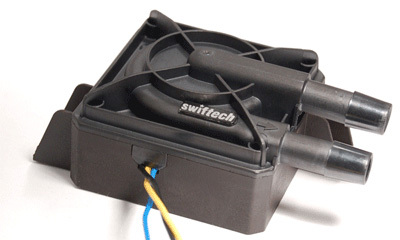 The pump is completely plug-and-play, and connects directly to any computer power-supply through standard 4 pin power connectors. It's compact and powerful motor make it ideally suited for extreme duty cooling in environments where space is at a premium. * Small Footprint: 2.4" x 2.4" x 1.5"
* 50,000 hours MTBF (Mean Time Between Failure) equivalent to 5 years lifetime. * The MCP355 can be used with full confidence in any MP servers, and high-end workstations. * Superior real world performance thanks to its high pressure characteristics (20ft of head). The MCP355 is particularly well adapted to the proliferation of daisy-chained liquid cooling devices in a single circuit: Multiple Processors, Chipset, Graphics, and Hard Drives. * Quick installation with adhesive neoprene pad, or permanent installation with screws and grommets. A Note of Caution! the MCP355 generates higher audible noise than the MCP350 and MCP655 pumps. This product is not recomended for users seeking silent operations.